YEAH its my birthday...He woke up on Monday in good spirits. 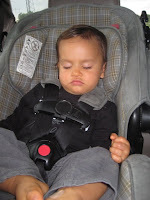 And as you can see after the museum he was EXHAUSTED. It was really FUN! 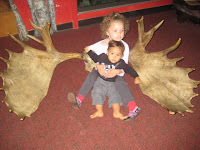 Every year since Solimar was one we would take her to the Camden Aquarium and now we will do the same tradition with Joaquin except that he will go to the Camden Aquarium with the exception of this year because we already went in March. 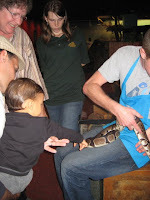 Joaquin touched a real snake. He took pics with exhibits although he wasn't happy with that. He was SCARED of all of them. I guess it was their SIZE and their REAL LIFE look with the exception of the snake and the live Butterfly Garden. 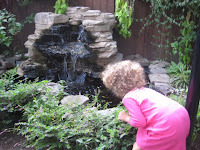 The butterfly garden was his favorite...He was in a daze just seeing so many fly around him. 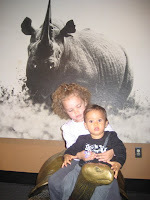 Solimar's favorite part was the DINOSAURS...They were HUGE! It was good day! My hubby and I even got to eat a Pat's Cheesesteak which we haven't had for about 5 years. 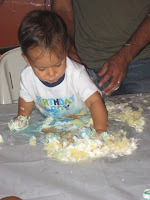 And here is how it progressively got MESSIER...But he LOVED it. It was a small get together. Perfect in every way. 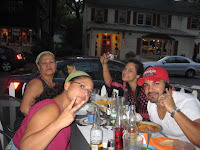 Our cousins and aunt from NY couldnt make it and a couple more close friends but he was surrounded with lots of LOVE. Joaquin has had a ROUGH year. He was born with a collapsed lung so he was in the NICU for a week when he was born. When we finally got to bring him home he wasnt eating or gaining weight and they were going to put him back in the hospital. 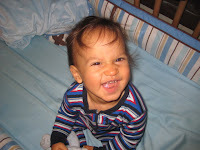 We begged them not to and even though I was nursing him (and still am) we had to give them a protein formula until his weight went up...He banged his front tooth pretty bad and now we have to see a dentist every couple of months to see if he damaged his permanent tooth. He had a pneumonia and bronchitis and now he was tested for food allergies and YES like Solimar he has them...So now I carry epi pens for him as well. Today he had 5 vials of blood taken to do more food allergy testing...More poor baby it is such a HEARTACHE to see him going thru this and very STRESSFUL! Joaquin, my baby boy, Mama loves you! 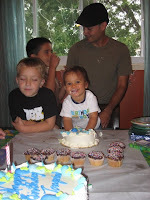 Hola...These are Joaquin's Birthday cakes and cupcakes. 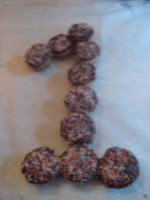 The cake with the #1 is called a smash cake. 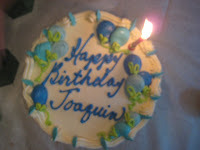 It's small and its for Joaquin to do as he wishes...The Bigger cake was DELICIOUS. 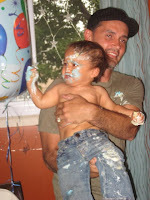 My cousin Melinda bought the cakes for Joaquin. They are from Sweet Eats in Marlton and this is the Family Bakery. Meaning ALL our cakes come from here even though the drive is FAR! 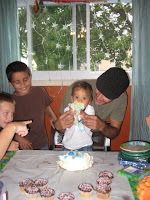 That is how good it is...Well next pics are the progression of Joaquin and his cake. 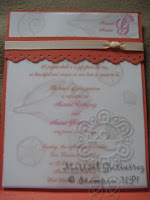 Hola Amigas...These are other samples from the Tango and Mambo wedding. The first one is a simple 5 x 7. The second is a criss cross card and the third and fourth are a catty case. Jennifer is still undecided as to which she will chose. I believe these are the last of my samples. Hola Amigas. 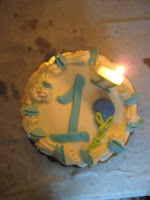 My baby Joaquin is 1. It didn't go fast and at times that was ok and others well...These are the favors I made for the kids. Aren't they cute. I purchased the template from somewhere I can't remember but it was SUPER TINY. So I made my own. Hola Amigas...I am going to SHARE ALOT today. These were Gabi's Birthday favors. I made 30 of each set. The first picture is the ones we gave away to all the kids. 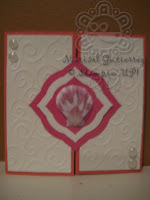 I made using the 2-4-6-8 tutorial on Splitcoaststampers. 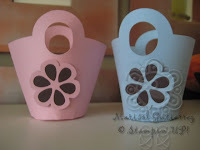 I also used the tags that were made with the Sizzix Basket & Blooms die. 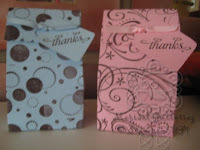 The second favors are made using the SU Baskets & Blooms die. These were given to me from my Bloggin Sister Susan Timmerman. 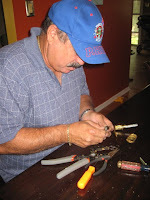 You can find Susan's Blog on my side bar. She is a very talented SU Demo. She was such a LIFESAVER. These bags the kids used to collect the goodies from the piñata. I originally was going to make this bag but changed my mind because I filled the bags with so much candy that the bottom of many kept falling off. 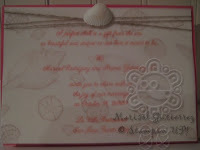 Hola Amigas...Here are more samples that I showed Jennifer on Saturday. The first is just a simple 5 1/2 x 4 1/4. Inside I made a pocket for accomodations and RSVP. The second one is a catalog case. Later I will share more samples. Hola Amigas. 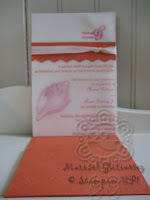 My friend Jenn is getting married and I am making samples of invitations for her to see. Her colors are Tangerine Tango and Melon Mambo. Well I have to admit it was hard to put the colors together as they are very similar. But I SO LOVE this sample. 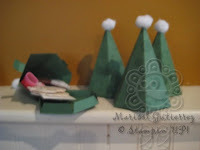 I also made the round accents on the corners with my hot glue gun...CLEVER huh? Then I painted them with the NEW champagne shimmer paint in the Holiday Mini 2009. So what do you thnk...Oh Yeah she is getting married in Puerto Rico. 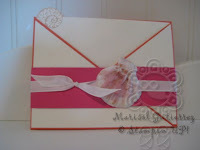 I am so JEALOUS and she chose a beach theme...Inside I made two samples (will share later). 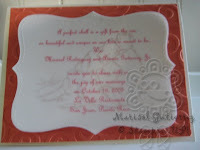 One sample has the couple in seaside sketches stamped in Creamy Caramel under the vellum. 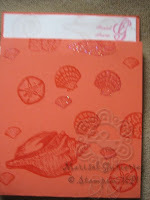 The other has Stipple Shells stamped in Creamy Caramel under the vellum. Good Morning Amigas. What a beautiful day. Solimar started Pre-K yesterday. YEAH for me. She will be going three days a week. She loved it. She has 5 new friends in her classroom and unfortunately 2 friends went to a different school. She now gets to eat lunch at school which she loves. Her favorite part is the writing center. If you know Solimar she is always walking around with a notebook. 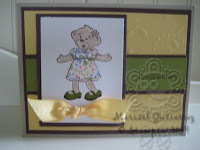 Well this cutie patootie card I made for a swap. I paper pierced her dress and added crystal effects to the shoes so they look like Mary Janes. 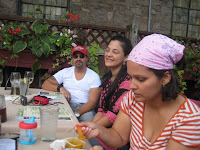 We have cousins Liz and Dean who come down to visit often...They are Solimar's earth parents. Sort of like god parents but more spiritual. The ceremony was held in Puerto Rico about 2 years ago in the ocean...It was amazing...I have to find the pics to show you...well anyways ever since Solimar was born they have had this amazing bond to her and her to them its beyond words. Well here we are eating in New Hope. Well actually the first pic and last picture was a restaurant we went to and as you know Solimar has sever allergies. So we told the waiter that we need to find out if they use peanut oil and such...Well this DUD of a girl put in our order and then says yeah they use peanut oil and everything is cooked together and we can just give your daughter a burger patty...How about...I DONT THINK SO! So we told her to cancel our order as we told her that the order was only to be made AFTER she spoke to the chef and it was SAFE for Solimar. So we left and went to our usual Mexican spot that know us and of course Solimar loves it as she gets to eat whatever she wants and everything is safe...The second picuture is most of us at the restaurant..
Hello Amigas...I am BACK! My dad left on Friday! Boo Hoo! 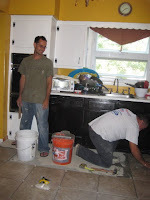 But over the course of almost two months he has been at work...In the first picture my dad is redoing my kitchen floor with my hubby and my soon to be brother-in-law, Cano (not pictured). 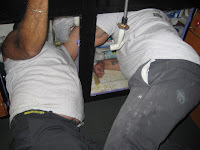 The second picture he is adding a new fixture to my sink with Cano (future BIL) and in the last picture he is fixing a piece from my fridge as the water and ice on the door wasnt working and now it is FIXED...Thank you Daddy...He also redid my sister Clari's bathroom and he went to my brother Pito's house and ripped up carpet and they HAPPILY found hard wood floors underneath...Can you tell my dad needs to keep busy. Hola Amigas...How is everyone doing? I am well. Just SUPER busy. And of course you all my Daddy is here on vacation. We are all having fun spending time with him. There are so many pictures I have to share with you but just don't have the time...So please be patient. I am going to share my baby boy's invite. 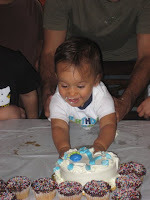 He turns 1 on September 28. Where has the year gone? I am attaching a Reinforced Cake Instruction Sheet. 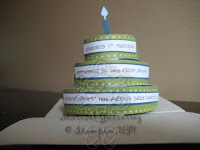 It makes such a BIG difference when creating the Three Tier Cake made by Sizzix. In celebration of the new Holiday Mini Catalog Laura Thorpe is giving away $25 worth of Stampin' Up products from the Holiday Mini Catalog! Your choice. You choose whatever you want up to $25. Have you seen the Holiday Mini? You can view it HERE. I love the new build a bear dies. I also love Sweet Treats. I can't wait to make these for Solimar's classroom. How much sweeter can a card be when you can actually include candy. I also can't wait to order Delightful Decorations and the matching punch. Super Cute! and what's the Holidays without Serene Snowflakes. I have seen some super cute samples with all of these items. Wow, so much to share with you today! The FABULOUS new Holiday Mini products are available beginning today, plus there's a great new hostess special too! 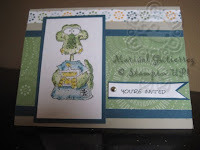 You can shop online at my Stampin' Up! website anytime! Just click HERE. After My Digital Studio is released to customers on October 1, hostesses who hold a $400 workshop will be eligible for both a $10 Holiday Mini item and 50-percent off My Digital Studio.